The easiest way to open live clams is to steam them open (how to steam clams). However if you’re planning on baking them or need them removed from the shell raw, you’ll need to shuck them. 1. Handle the clam gently – too much pressure and it may close its shells more tightly in response to the perceived threat. 2. Hold the clam against the base of your thumb, with one side pressed into the meat of your thumb and the hinge angled upwards (so the front faces down & toward your pinkie). 3. Place the blade of the clam knife against front of the clam, with the sharp side up against where the two shells meet. 4. Curl your fingers up and around the blade, pushing into the gap between the shells in a smooth motion until it glides between them and into the interior of the clam. 5. 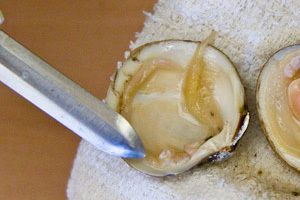 Once the blade is inside the clam, angle it up so that it is scraping against the interior of the top shell. Scrape along the top shell until you cut both adductor muscles. 6. You should now be able to open the clam. Gently slide the clam knife’s blade under the meat and scrape against the bottom shell to separate the meat. 7. Check the clam meat and juice (“liquor”) for shell fragments – remove any you find, then continue with your recipe. In a pinch this method will also work with some other thin, broad knives – just be careful not to cut yourself! 1. Hold the clam in a towel with the hinge facing you. 2. Insert your knife into the crack between the two shell halves at the hinge. While the knife can be jammed directly into an oyster before twisting, clams require more of a wiggling/jimmying motion to insert the blade deep enough before turning to pop the shell open. 3. Once the point of the knife blade is completely inserted into the clam shell (up to the point where the blade widens), twist your wrist from side to side to lever the shell open. 4. Once the clam is open, run the point of the knife around all of the meat to separate the membrane (as opposed to an oyster when you only need to dislodge the foot). Note: Because of the amount of force involved, there’s a higher risk of shell fragments ending up in the clam meat, so take care to check each clam before cooking or serving. 5. If serving on the half shell (usually baked): Unlike an oyster which has asymmetrical sides, either side of a clam shell can be served on the bottom, so pick whichever side looks best.